British brand 4160 Tuesdays has quite a number of fragrances that are brim full of wit. In a world where perfumers can be painfully pretentious or rudely arrogant, the approach taken by indie perfumer Sarah McCartney is refreshing. A perfume called Tart’s Knicker Drawer can’t fail to amuse and happily the scent itself is just as playful. It smells exactly the way I thought (and hoped) it would. I think Sarah McCartney is particularly talented at creating vintage inspired scents, such as Doe in the Snow which is a 70s-style fruity chypre. Tart’s Knicker Drawer also has a definite retro feel. It’s a powdery cloud of gorgeousness with a silky, ambery base reminiscent of the full-bodied perfumes of the past. Released in 2014, Tart’s Knicker Drawer actually came into being by pure chance. 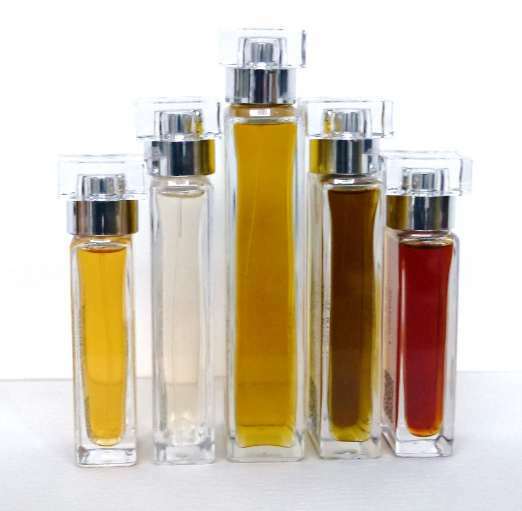 After a day of filtering six perfumes at once, Sarah remarked on Twitter that she smelt like “a tart’s boudoir”. The positive reaction encouraged her to experiment further and refine the combination. The result is an incredibly smooth, complex yet easy to wear fragrance. I would recommend not dwelling on the notes too much because it’s an exceptionally well blended, abstract perfume. But to give you an idea, I’d say it’s a raspberry swirl over rose/violet powder with a satin ribbon of jasmine – all on a plump pillow of amber and vanilla. The fact that it is sweet but not syrupy, makes it womanly rather than teenage, which I love. The woman we’re talking about here is feminine and voluptuous. She is more cheeky than outright tarty; there’s no filth hidden behind the scenes. She enjoys getting ready for a night out as much as the evening’s entertainment itself. She loves the ritual of applying full make-up, scenting her skin and dressing-up in sophisticated yet figure-hugging clothing. Tart’s Knicker Drawer is all about the boudoir mist of old-style lipstick, face powder and perfume. This concoction ends up clinging to silk stockings and satin undergarments. Its coquettish, vintage style is very fitting for a Varga Girl. Painted by the most famous pin-up artist of all, Alberto Vargas, the 1940s Varga Girl portraits are glamorous, flirtatious and fun, just like Sarah’s scent. During World War II, many U.S. servicemen chose to adorn their aircraft, ships and even uniform jackets with Varga Girl images copied from the pages of magazines and calendars. I find Tart’s Knicker Drawer in Eau de Parfum strength lasts remarkably well with lovely soft focus sillage. Have you tried Tart’s Knicker Drawer? Do you like any boudoir scents? Please let me know in the comments. This entry was posted in By Tara, Fragrance Reviews and tagged Fragrance, Perfume, Review. Bookmark the permalink. Fab review, Tara! I love the Varga Girl connection and imagery. I bought this for my mother this Christmas and she loves it! Thanks Thomas! You mum’s great. I’m happy she loves this one too. I dunno, but this sounds awesome! I think it’s pretty awesome Joan! What a great review and intriguing house. Love the idea behind this one….no pun intended…well not much anyway. But lovely and wonderful to read. Must try it when I am feeling particularly voluptuous and Vargasy. Nice to “see” you Lanier. I think you would you wear this one very well indeed. Echoing what Thomas said about the perfect link with Varga girls. The ethos of this scent also reminds me of the Benefit cosmetics packaging. I like Tart’s Knicker Drawer a lot and you have captured it to a ‘T’. (There’s a clue in your name! 😉 ) I am also partial to several of the Agent Provocateur range, and to JHAG Lady Vengeance, which are in this boudoir kind of vein. Pleased to hear you think I captured it V, as you’re also a fan. Thanks for sharing your other boudoir faves. I don’t think I have tried this one, but I love the Vargas image for it. There is always some surprise with Sarah’s scents – the given notes do not mean much, because what she does with them is often so unusual. That goes both ways of course, and I would strongly advise to buy before you try. Easily done thanks to her lovely sample packs. Completely agree, Sabine. Blind buying is rarely a good idea but probably even less so with this house. Although technically an oriental, Tart’s Knicker Drawer comes across as a chypre to me. Powdery lipstick scents aren’t usually my cup of tea but your review is positively irresistible, Tara! Love the Vargas girl illustration. I’ve read many positive reviews of this line but haven’t sampled any yet. I think they might be difficult to find in the States? (I could be completely wrong on that). There are just so many perfumes to chase! There are so many perfumes out there, it is impossible to keep up. However, 4160 Tuesdays are available at Luckyscent if you’re interested. Can’t wait for July, Val. I have to say, I love the name. Boudoir, satin, silk… sounds great, I could do with this one to compensate the way I am. 😉 Sometime ago, I was ready to order some samples and other stuff from 4160 Tuesdays but at the check out, I got freaked out by the postage. So I haven’t tried any of theirs yet. Oh that’s too bad, thinkingmagpie. I hate it when the postage puts you off ordering samples. These types of scents are fun to read about, but in real life? I tire of them within the first sixty minutes. Too much stereotype association for my preference. That’s a shame but luckily there’s so many different types of scent out there to choose from. Great review, and I’ll repeat that the Varga girl image is perfectly suited to the review and the fragrance. I liked the perfume but felt it wasn’t the right time of year to wear it as my cold skin wouldn’t hold on to it, so I’m looking forward to trying it again soon in milder weather. For Boudoir scents I think this one, as well as the agent provocateurs, are a bit too nice perhaps? I think more something like VW’s Boudoir which I can’t wear and Opus V, that Suzanne wrote a great review of, has a nice mixture of powder and sensuality for a Boidoir I find. Asali, I think you make a great point about your boudoir scents needing a bit of naughtiness. I guess Putain des Palaces would come under that banner. I can only seem to tolerate the nice ones unfortunately. All the same, I hope TKD works better for you in warmer weather. It’s nice that so many commenters thought the Varga Girl was a good match. rickyrebarco, as Sabine above was saying, it’s a brand with quirky scents and I have a hard time with indie perfumes as it is, so I completely get where you’re comng from. This is the first of Sarah’s I’ve fallen for. I hope you don’t regret relenting! Okay, I’ll keep my fingers crossed! Tara, I love how playfully flirty you make this perfume sound: from its raspberry swirl to its “boudoir mist” of old cosmetics, to its plump amber-and-vanilla bottom, it sounds like the perfume truly matches its name. I love when a perfumer has a clear concept and is able to convey it so well. Hee hee! I love it. Thank you Suzanne. It’s funny how this perfume was born by accident but grew up into something with such a strong identity. I really love this fragrance. It so much fun to wear. I totally agree Katherine. It’s fun but complex and grown-up at the same time.